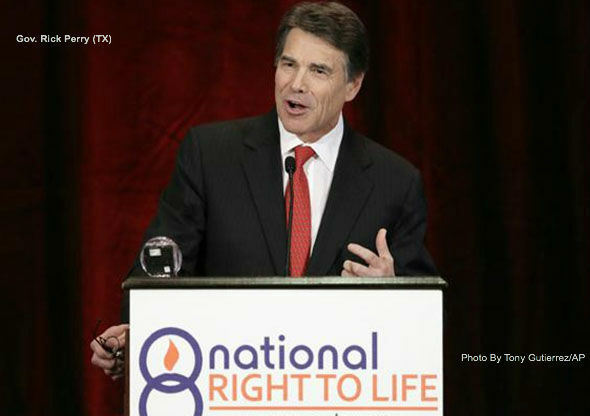 Texas Governor Rick Perry and committed Republican pro-life members of the Texas state legislature have stepped forward to defend the right to life by proposing legislation that would limit abortions past the 20 week mark, when the baby is viable outside the womb. Because, if you watch the old networks or read the old daily newspapers you might think what’s been going on in Texas is a debate over women’s rights or health care, not killing babies. The leadership of the national Democratic Party has jumped into the fray to the point that Washington’s two most powerful Democrats; Barack Obama and Harry Reid — not to mention a Dixie Chick – have waded in on the baby killing side of the Texas abortion showdown. However, Reince Preibus, the Chairman of the Republican National Committee, has chosen to entirely absent himself and the RNC from the debate. To Texas Republicans and social conservatives it seems hardly possible that the Party of Ronald Reagan, author of "Abortion and the Conscience of a Nation," the only book written by a sitting president, would sit out such a consequential public policy and moral debate. However, according to POLITICO’s David Nather, that is exactly what is going on. Democrats for their part have jumped squarely into convicted murderer Kermit Gosnell territory by opposing any limits on abortion, even after 20 weeks when the child is clearly capable of life outside the womb. This has placed the national Republican leadership in the position of ceding the moral high ground on an issue where the majority of Americans are on the side of the right-to-life. Most Americans favor some restrictions on abortions, and a Gallup poll earlier this year found that their support for legal abortions drops dramatically after the first trimester. There’s also the National Journal poll that found 48 percent of Americans would support a ban on abortions after 20 weeks. And the Texas bill, specifically, gets high levels of support, at least among the state’s voters: a Texas Tribune poll found that 62 percent of the state’s voters would support eliminating abortions after 20 weeks. Yet, national Republicans have declined to weigh in. And a key party official in Texas has acknowledged there’s no behind-the-scenes help coming. As POLITICO’s Nather put it, national Republican leaders will talk about the Texas abortion bill when they’re asked about it, but they aren’t swooping into the fight with the same enthusiasm as liberals. The national Democratic leadership has no such concerns and has unabashedly put itself on the side of the infanticide wing of the far-left liberal sisterhood. When Texas Democratic state Senator Wendy Davis’ filibuster dealt the abortion limits bill a temporary setback, Obama’s Organizing for America (OFA) quickly put out an email calling the Texas abortion limits bill a disturbing attack on women. According to the San Antonio Express-News, big-time Texas Democratic donor Amber Mostyn tweeted Tuesday night that she would match donations to Annie's List, a state organization that backs candidates who back abortion rights, including Texas State Senator Wendy Davis, the organizer of last week’s filibuster that helped kill the Texas abortion limits bill. The group's director told the paper that it raised $25,000 (plus Mostyn's match) from that tweet alone in just four hours. Likewise, National Journal reports that Rep. Colleen Hanabusa, D-Hawaii, quickly asked donors to help her emulate state senator Davis by taking the fight for women's rights to the U.S. Senate, according to a report in Roll Call. Sens. Claire McCaskill, D-Mo., and Amy Klobuchar, D-Minn., each also asked supporters to sign a card (and give their email addresses) to a campaign thanking Davis. In the face of this onslaught, why was the Republican National Committee nowhere to be seen, even as the Republican Platform contains a strong condemnation of abortion? Alaska’s former Governor Sarah Palin might just be on to something about forming another political party if our present choices are the Gutless Old Party or the Party of No Moral Compass. It is time for the RNC and Chairman Reince Preibus to speak and work in favor of the Texas bill or risk losing the right-to-life vote to a new organization that will stand for the principles national Republicans say they support, but never seem to actually step-up to fight for.